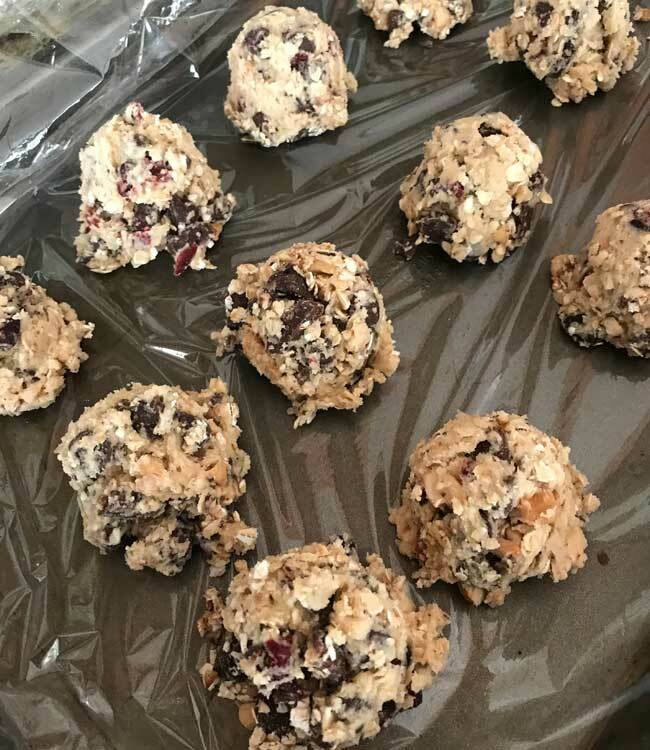 These chocolate-loaded oatmeal cookies include the flavor and textures from cashews, dried cranberries and a chopped up orange flavor chocolate bar. Thoroughly mix together flour, baking powder, baking soda and salt; set aside. In a large mixing bowl, beat the softened butter and both sugars and until creamy. Add the egg and vanilla and continue beating for another minute, scraping the side of the bowl often. If using a stand mixer with a paddle, use low speed and add the dry ingredients, letting the paddle stir until blended. If using a handheld mixer, add the dry ingredients by hand and stir until blended. Stir in the oats, dark chocolate, chocolate chips, dried fruit and nuts. Using heaping tablespoon scoop or better yet, a medium size cookie scoop, scoop out cookies and bake on prepared baking sheets for about 12 minutes. Let cool on sheets for 3 minutes and transfer to a wire rack. Repeat, baking one or two sheets at a time if you prefer, until cookies are baked. I usually scoop out balls of dough, lay them on plastic wrap lined plates, cover and chill, then put the chilled dough balls in a freezer bag and bake as needed. If you like the flavor of orange, you can use an orange flavored chocolate bar (such as a Lindt) in place of the chopped dark chocolate. The orange pairs well with dried cranberries. Or use another flavored chocolate bar just to mix things up.